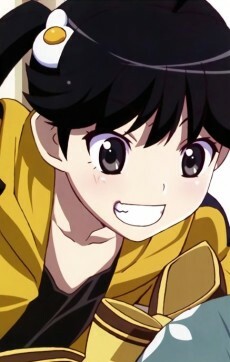 Karen, the main character of Karen Bee, is one of Koyomi's sisters. She is older than Tsukihi and always doing outdoor activities. Despite being younger, Karen is taller than Koyomi, much to Koyomi's dismay. In Karen Bee, her hot-headed personality and her habit of acting before thinking lead her to be stung by a bee which leads to being poisoned with a terrible fever that lasted for 3 days. Like Hitagi, she refused any help from anyone which eventually leads to her and Koyomi fighting each other. Later it was revealed that it was set up by Kaiki. Karen and Tsukihi are nicknamed Tsuga no Ki Nichū no Fire Sisters (栂の木二中のファイヤーシスターズ, lit. Fire Sisters of Tsuga no Ki 2nd Junior High). It was revealed that the reason she and Tsukihi found boyfriends was so that Koyomi would become jealous. They found boyfriends in Koyomi's image with Karen's boyfriend being shorter than her. She and Tsukihi also thought that Koyomi's girlfriend was Tsubasa. Koyomi, Karen and Tsukihi's parents were revealed to be police officers.